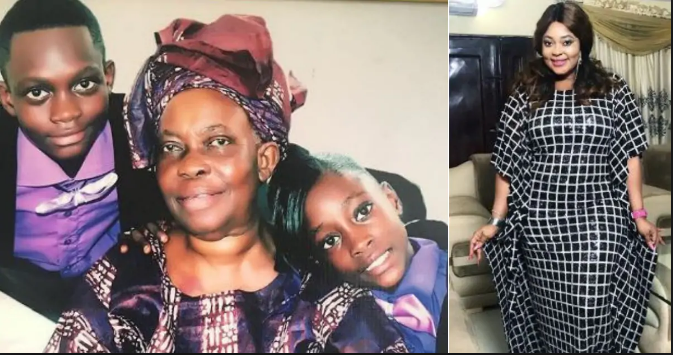 Nollywood actress Biodun Okeowo who lost her mother a few weeks ago has taken to her IG to speak on her passing. According to the mother of two, she thought her family were trying to lure her back to Nigeria from Canada when they broke the news to her. ”Mummy today makes it a month that you left. March for me will never be the same. I can never forget that 6: am call while in Canada that we lost you. It seems like a joke that morning. Seemed like it was a stunt to bring me back home. Not until I saw your lifeless body. Then I believe my only true love is gone. My prayer warrior is gone! My one and only best friend, my confidant will not be there for me anymore. We fight we make up… yet no one compared to you in this whole world. Sisi till your death you took care of me like I’m still a baby. A day before you left, mummy you washed my clothes and cooked ikokore for me. Never knew that will be the last meal you will cook for me. Never believe we will plan your burial in 5 years to come. Mummy, you were so strong and hardworking. You want to do everything by yourself and even do more for us your children. Really trying to be strong but it’s so hard!!! I pray every day, the part of my prayers are unrealistic; I wish I can see you again. I wish God can perform a miracle. You really toiled for my brothers and I, especially for me, you did everything to make me who I am. You single-handedly strived for me. God really used you for us. If not for God and you mummy?